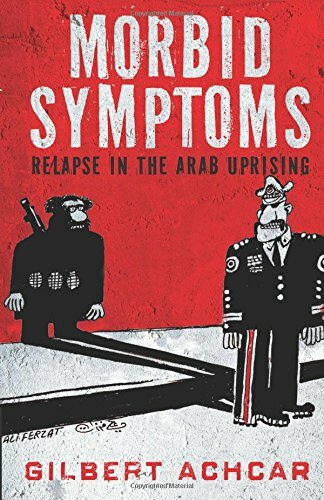 Gilbert Achcar’s aptly titled Morbid Symptoms: Relapse in the Arab Uprising arrives at the very moment when Bashar al-Assad’s military and his assorted foreign legions are on the brink of final victory over the rebels according to some analysts. As the killing machine advances on East Aleppo in order to impose a siege that will likely cost the lives of thousands of civilians through a combination of bombing and starvation, it is a supreme irony that al-Assad will be following essentially the same strategy that Adolf Hitler used against Leningrad in WWII but with Putin’s air force standing in for the Luftwaffe. Meanwhile, Amnesty International reported that Egypt’s National Security Agency (NSA) is abducting, torturing and assassinating activists in unprecedented numbers in order to intimidate the entire population into accepting President Abdel Fattah al-Sisi’s neoliberal regime. While the title of Achcar’s book is a reference to such reversals in Syria and Egypt, it also might remind one of the ideological morass of large sections of the left that cannot make the connection between al-Assad and al-Sisi. Al-Assad manages to enjoy the support of a wide spectrum of leftist intellectuals and journalists even if it is accompanied by the disclaimer that he is not very nice. Meanwhile al-Sisi is universally condemned. Morbid indeed. But if you put aside geopolitical bias, you cannot help but recognize the similarities between the two despots since they both claim to be defending secularism and democracy against Islamists. With the Muslim Brotherhood serving as al-Sisi’s bogeyman and a wide variety of Islamist militias in Syria functioning as al-Assad’s scapegoat, one might expect both dictators to be equally blessed by the pro-Baathist left. What prevents al-Sisi from getting such support is that he never was an ally of the Kremlin either during the Cold War or afterwards. It is the singular merit of Gilbert Achcar’s scholarship to transcend Cold War mythologies and to examine class relations in Middle East and North African society to arrive at an assessment of the current conjuncture. He rejects the Scylla of “secular” dictators on one hand and the Charybdis of Islamists on the other, urging the left to adopt a principled, class-based orientation that while difficult to maintain in a hostile political environment remains necessary. Morbid Symptoms is divided into three parts. A chapter on Syria is titled The Clash of Barbarisms, which despite evoking Samuel Huntington’s Clash of Civilizations and Tariq Ali’s The Clash of Fundamentalisms: Crusades, Jihads and Modernity, is distinctly Achcarian and solidly within the Marxist tradition. Unlike Huntington and Ali, who follow geopolitical compasses of either the right or the left, the unit of analysis for Achcar is class, not the nation-state. If there is anything that has disoriented the left ever since the spring of 2011, it the failure to think in class terms. The chapter titled The “23 July” of Abdul al-Sisi examines Egyptian politics in the aftermath of General al-Sisi’s coup within the framework of the Egyptian left’s failure to develop an independent class orientation against two equally reactionary forces. The political lessons to be drawn from this debacle are not only necessary for moving forward in Egypt but for an entire region that is now polarized between Islamists on one side and self-appointed military saviors on the other. The conclusion, subtitled “Arab Winter” and Hope, is a brief survey of developments in Libya, Tunisia and Yemen that despite its brevity is essential for understanding the region’s difficulties and possibilities. Despite the “anti-intervention” posturing of the pro-Baathist left, the most significant imperialist intervention in Syria was to block the shipment of MANPAD’s to the Syrian rebels from non-USA sources. The net result of this imperialist intervention has been to foster a devastating asymmetric warfare. With regime jets and helicopters, augmented eventually by Russia air power, al-Assad has levelled entire urban centers such as East Aleppo and Homs. Homes have been destroyed, hundreds of thousands killed, and survivors forced to seek refuge in Europe even if it meant taking perilous voyages across the Mediterranean to destinations where nativism reigned supreme. Despite the reputation that Saudi Arabia, Turkey and Qatar have as fierce enemies of the Baathist regime, they cooperated with the USA to keep MANPAD’s out of the hands of the rebels. Achcar cites an October 17, 2012 Wall Street Journal article that details the efforts of a task force consisting of these supposedly “regime change” states working with the CIA to block MANPAD’s from reaching Aleppo even though the rebels “pleaded” for an effective defense against aerial bombardment. Some on the left might argue that such weapons can fall into the hands of al-Qaeda or ISIS and thus lead to the downing of civilian aircraft. Achcar answers these concerns by referring to an article by military affairs analyst Anthony Cordesman that reveals how they can be modified to be disabled if they fall into the wrong hands just as easily as a stolen laptop. Regime collapse, while not considered a likely outcome, was perceived to be the worst possible outcome for U.S. strategic interests [emphasis added]. Was the CIA’s decision to block the shipment of MANPAD’s consistent with the strategic planning at one of the Pentagon’s primary R&D resources? It would appear to be so. If the Free Syrian Army had been able to secure the weapons it needed to neutralize the Syrian air force, it is likely that the war would have come to an end long ago. Syria would have been forced to tackle a new set of problems but at least the wholesale murder of civilians in working-class neighborhoods would have come to an end. Instead the war dragged on and Islamic rivals to the FSA were able to usurp the leading military role largely because of their ready access to money and weapons from likeminded benefactors in the region. There was an inherent contradiction between the aspirations of the Syrian masses and the conditions brought on by militarization. Warfare is a costly business and the deep pockets of states like Qatar, Saudi Arabia and Turkey could be helpful in material terms but only with strings attached, namely adherence to a political program that was inimical to the goals of the Arab Spring. Turkey was determined to be rid of al-Assad but only as part of a broader campaign to deny the Kurds the right of self-determination. After the birth of grass roots democracy, the Turkish government felt threatened by it in the same way that al-Assad feared the democratically-minded opposition based in civil society. Basically, Erdogan and al-Assad had common class interests despite their geopolitical rivalries. Indeed, recent news that Turkey was ready to realign its relationship to Syria indicates that class trumps religion as the support of the Sunni bourgeoisie for al-Assad should have indicated all along. In order for any progressive potential to materialise in an organised political form among the Syrian people at large, the precondition at this stage is for the war to stop. In that regard and given the abysmal situation that has arisen in Syria after four years of war, the appalling level of killing and destruction, and the immense human tragedy represented by the refugees and displaced persons (about one half of Syria’s population), one can only wish for the success of the international efforts presently being deployed to reach a compromise between the Syrian regime and the mainstream opposition. But when the threat of Kerensky being overthrown by a counter-revolutionary coup led by General Kornilov became real, the Bolsheviks defended Kerensky’s government from the threat from the right. Trotsky helped organise the defence of Kerensky from the prison cell in which the very same Kerensky had put him. Considering John Rees’s regrettable tendency to demonize Syrian rebels as threats to secularism and democracy, one might accuse him of using a double standard. Perhaps if al-Sisi had a background as an “anti-imperialist” in the Gaddafi and al-Assad mold, there would have been greater readiness to back the coup. That being said, it is entirely conceivable that before very long, he will be seen as part of the anti-imperialist camp given the reports from as early as mid-2015 that Egypt and Russia would be strengthening their ties through the creation of a free trade zone and Egypt becoming part of the Eurasian Economic Union, the Kremlin’s competition to the EU. Now that is where your mistake begins, we say to the Mensheviks. True, the Socialist-Revolutionary doctrine is pernicious, fallacious, reactionary, adventurist and petty-bourgeois. But these vices do not prevent this quasi-socialist doctrine from being the ideological vestments of a really revolutionary—and not compromising—bourgeoisie and petty bourgeoisie in Russia. Based on this criterion, the Muslim Brotherhood could hardly be put in the same category as the SR’s. Their commitment to democracy was always on a tactical basis, namely whether it could advance their own goal of creating an Islamic state. That being said, the best approach to Egyptian politics is not through the prism of Russian history but class relations within the most populous Arab nation that has historically played a key role in setting a pattern for other nations. To understand what political options the left was forced to make three years ago requires an analysis of the Muslim Brotherhood itself. For this, citations from either Lenin or Trotsky have limited value except as a reminder that the SR’s emerged out of the Russian revolutionary experience. After all, Lenin’s brother was a Narodnik. To understand what al-Sisi stood for, it is better to look at Egyptian history and particularly the Nasserist model that figured heavily in the events of July 2013. He exploited the reputation of the nationalist leader to conceal an economic program that differed radically from Colonel Nasser’s nationalism, crowned by the bold seizure of the Suez Canal. For many Egyptians, Nasser is the Father of the Country in the same way that George Washington and Mustafa Kemal were for the USA and Turkey. When Mohammed Morsi became president of Egypt in the summer of 2012, the liberal and left opposition were seduced by Nasserist rhetoric that camouflaged counter-revolutionary goals. Since the Morsi administration was accommodating itself to the military immediately after taking power, it was not difficult to understand why the left was unable to think outside the box. It might be likened ironically enough to Erdogan’s recent bid to refashion himself as a neo-Kemalist. For its part, the USA was prepared to live with if not prosper by the rule of either Morsi or al-Sisi. Despite its willingness to take part in the mobilizations against Mubarak, the Muslim Brotherhood never sought the transformation of Egyptian society. Its model was Erdogan’s Turkey, a model whose viability was already eroding rapidly on the eve of Morsi’s taking power. If in Turkey, the model could be married to an expanding manufacturing sector led by a pious Anatolian bourgeoisie, what applicability would it have to Egypt, a country that was suffering from a deep economic crisis that had spread across the entire Middle East and North Africa and that was a key factor in the Arab Spring? On 17 October, the new Egyptian ambassador to Israel handed then-Israeli president Shimon Peres a letter from Morsi in which the Egyptian president addressed his counterpart as “my great and dear friend”, expressed his “strong desire to develop the affectionate relations that fortunately bind our two countries”, and wished Israel “prosperity”. Confident that Washington had his back, Morsi issued a new constitutional decree one day later that gave him unprecedented power. If he saw himself as following in the footsteps of Erdogan, he neglected to polish the shrewd tactical skills of the Turkish authoritarian. From that point on, the opposition would congeal around a program that while opposing authoritarianism was all too ready to cede power to al-Sisi. In a way, it was presenting the Egyptian people with the same kind of Scylla and Charybdis choice as offered to Syrians: authoritarianism either in a beard or in a necktie (or strictly speaking, a uniform). In class terms, the Morsi government had the same disregard for working class rights as the AKP. Workers had their own class interests that would not be mollified by parliamentary democracy. They clashed with the government repeatedly in 2013, emboldened by the spirit of defiance that had arisen ever since the occupation of Tahrir Square. That year there were nearly as many working class protests as in the decade that concluded in 2010. This was something the Muslim Brotherhood would not tolerate. In April 2013, the army was used to suppress a strike of 70,000 railroad workers—evidence that the military and the Islamists shared class interests. Unfortunately, the workers’ movement lacked the power to determine the outcome of the conflict between the army and the Muslim Brotherhood. That task fell on the shoulders of the Tamarrod Movement (the Arabic word for rebellion) that cobbled together the pro-democracy sentiments of Tahrir Square with Nasserism. The young people who rallied in Tahrir Square mistook the military’s decision to remove Mubarak from office. This was not a sign that it was on the side of the people, only that it sought to defuse a highly volatile situation that could have gone much further if the working class’s big battalions became a factor. It is a symptom of the calcification of Syrian politics that such a maneuver was rejected by the Baathists in favor of a genocidal war that has ruined the country economically and socially. Assadism without Assad was never a viable option. As opposed to John Rees, his former comrades from the SWP-led international movement aligned itself with Tamarrod. The Revolutionary Socialists party in Egypt saw this as an opportunity to push for a radical program within the context of a mass movement whose goals were a mixture of progressive and reactionary elements. Most importantly, the very backbone of the old regime, the army, played a pivotal role in the success of the gigantic anti-Morsi mobilisation on 30 June 2013. The closer the deadline of Tamarrod’s petition campaign approached, the more open the military’s support for the mobilisation became. One week prior to the long-planned climax, Abdul-Fattah al-Sisi proclaimed loudly and clearly that the military would protect the nationwide demonstrations and rallies — this a few days after the Muslim Brotherhood, on 15 June, had ominously flexed its muscles by staging a massive rally in Cairo in solidarity with the Syrian uprising, on an openly Sunni-sectarian and jihadist platform. Morsi addressed the rally in person, announcing the severance of diplomatic ties with Damascus and calling for a no-fly zone over Syria. It can on occasion and for purely tactical reasons strike together with “unlikely bedfellows” — whether with Islamic forces against old-regime forces, or vice-versa — but it should always be marching separately, clearing its own fundamental path at equal distance from the two reactionary camps. Tactical short-term alliances can be concluded with the devil if need be; but the devil should never be portrayed as an angel on such occasions — such as by calling the Muslim Brotherhood “reformist” or the old regime forces “secular”, thus trying to prettify their deeply reactionary nature. While it is beyond the scope of Gilbert Achcar’s book, and in many ways beyond the scope of any living human being, there is an overarching question that this reviewer has been grappling with since the early 1980s when he witnessed the early stages of the implosion of the Socialist Workers Party, a group that Leon Trotsky held in the highest esteem. As might be obvious from Achcar’s words cited above, the idea of “marching separately” and implicitly “striking together” are the hallmarks of the Trotskyist movement’s United Front strategy. Sharing the fate of the Communist and Maoist parties of the sixties and seventies, the Trotskyist movement is now significantly weaker. There was a period when someone like Ernest Mandel could have spoken to large audiences in Syria or Lebanon and sowed the seeds of a revolutionary organization capable of carrying out the United Front alluded to above. In the absence of such a movement and even those with far more imperfect programs, a vacuum came into existence that the Islamists were all too eager to fill. When the Arab Spring arose, the well-organized and well-funded groups like the Muslim Brotherhood were able to prevail over inexperienced youth whose understanding of class politics was underdeveloped. In other parts of the world, when mass movements lacked the experience and acumen to take a fight to its conclusion, there was always the possibility of recovery and preparation for a new round in the class struggle. In Syria, Egypt and the other countries analyzed by Gilbert Achcar, the possibilities for renewed struggle on a higher level are much more constrained. The ferocity of the ruling classes, the absence of a powerful working class (except in Egypt), and the entrenchment of political Islam makes the left’s task more daunting. Perhaps the most important task in this period is to bring to bear the political clarity that can help a new generation of activists become grounded in Marxism. As such, a book like “Morbid Symptoms: Relapse in the Arab Uprising” will have the power of a well-aimed artillery shell.